Our focus has shifted from Social Media to VISUAL Social Media. We are drawn to “visual content” online in more ways than ever before. The opportunity this provides for business is massive. But there are some key concepts and strategies that you need to know in order to leverage the power of this shift towards using visual content in social media. There is no denying that a massive shift has happened in the way we communicate online, especially with Social Media. We are now, in reality, using Visual Social Media to share our message. What began with websites, became dynamic websites or “blogs”. The humble Blog attracted interaction, comments and community-building around posts or articles of 500-1000+ words in length. Then posts became shorter and we embraced Facebook, and then shorter again as 140 word “tweets” sprouted on Twitter and introduced a new way of communicating. We had moved from Blogs and Blogging to Micro-blogs. We also made the shift from Tell to Show. Facebook, Twitter and Blogs became more visual. Images were showcased everywhere. Microblogs evolved into Multi-media Microblogs with sites like YouTube and Tumblr offering the rapid, visual transfer of information in entertaining formats. These platforms allowed us to devour visual material quickly. And so it was inevitable that we would reach a point where Image-based social networks such as Pinterest and Instagram have grown at exponential rates. These Platforms are breaking all records. Platforms where no words are necessary. Where a picture really does say a 1,000 words. What Does This Shift Mean For Your Business or Brand? In short, it means that businesses or brands online need to take note of the stats. In 2012 alone we have seen You Tube pass 4 Billion Daily Video Views and Pinterest become the 4th largest driver of traffic worldwide. UPDATE: In fact, Pinterest, has just recently become the 2nd largest driver of traffic worldwide. You can read more about the latest stats here and here. With Pinterest becoming one of the fastest growing networks, Instagram has matched this with massive growth and high rates of engagement. Instagram was recently reported by Dane Atkinson (CEO of SumAll.com as having as much as 10 times greater engagement than other platforms like Facebook and Twitter. Not bad for a little photo sharing site. Is it any wonder that Facebook snapped it up for $1 Billion? We have reached a point where we are, literally, saying 1,000 words with just one Picture, Image, Photo or Video. The team responsible for popular Online Photo Editor PicMonkey.com reported to us that they are averaging 4.3 million images edited daily – an impressive result after just 8 months online. But not surprising, given the visual shift that is happening around us. And the DIY design tool Canva is allowing more business owners to see the benefits of creating their own images. For business, this means a massive opportunity for businesses who can leverage the power of visual marketing. If we can learn how to use images, photos, video, and other visual media in our online marketing, then we have a greater chance of reaching more people with our message. This then provides the opportunity for more exposure as visuals drive traffic to our websites products and services. 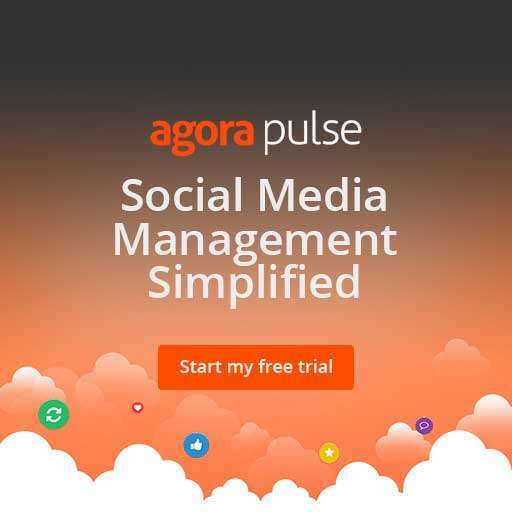 How Can Your Business Leverage the Power of Visual Social Media? Whenever possible, use VISUALS to share your message. This includes pictures, images, infographics, videos, graphics, slideshows and animations. 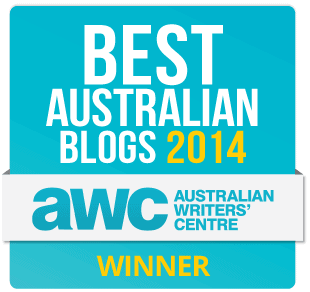 JustB is a lifestyle blog in Australia. Their team often use images to be the 1st way to convey a message on Facebook Posts. The text and links are there to provide context. Very clickable. Anyone hungry? Visual Social Media thrives on “sharing”. If you can provide original content for others to share, (that links back to your business, website, products or services), then you are ahead from the outset. For example, did you know that over 80% of pins are repins on Pinterest? That means that 80% of information is “shared” and only 20% of content posted up is original. Be the 20% that gets repinned by 80% of users, by creating your own original content! Here are some ways you can create your own original content by investing in the creation of original visual images that you can share on social media. These do not need to be fancy or expensive. Keep the focus on “original”. Get some in-house training in basic editing for your team. You will be rewarded with productivity and cost-savings when you and your team can create and edit your own images for use online. Use iPhone/smartphone photo apps like Instagram, Over or Phonto to take relevant, original images, and to add filters and funky fonts. You can read more about how to use apps to get professional looking photo effects here. I’m loving a tool called Easil which makes it so easy for teams to create visuals – and some pretty edgy templates and fonts too! Learn to use quality DIY editing programs like PicMonkey.com or Adobe Spark. I have posted about my enthusiasm for Canva and Canva’s iPhone app here. I love them both. a quality Facebook Cover Photo or a series of promotional images to be shared across platforms. a quality checklist or tutorial/instructional infographic. a slideshare presentation that is professionally designed or illustrated. an animated, or professionally filmed and edited video to be featured on your website and shared to other social media sites. Think about what information you can provide that is useful/helpful or inspirational. Information that Helps or Inspires is amongst the most shared content, especially on Pinterest. Likewise, Quotes and inspirational messages are shared like wildfire on Facebook. How can you and your team create some simple, shareable images that showcase what you do as a business? 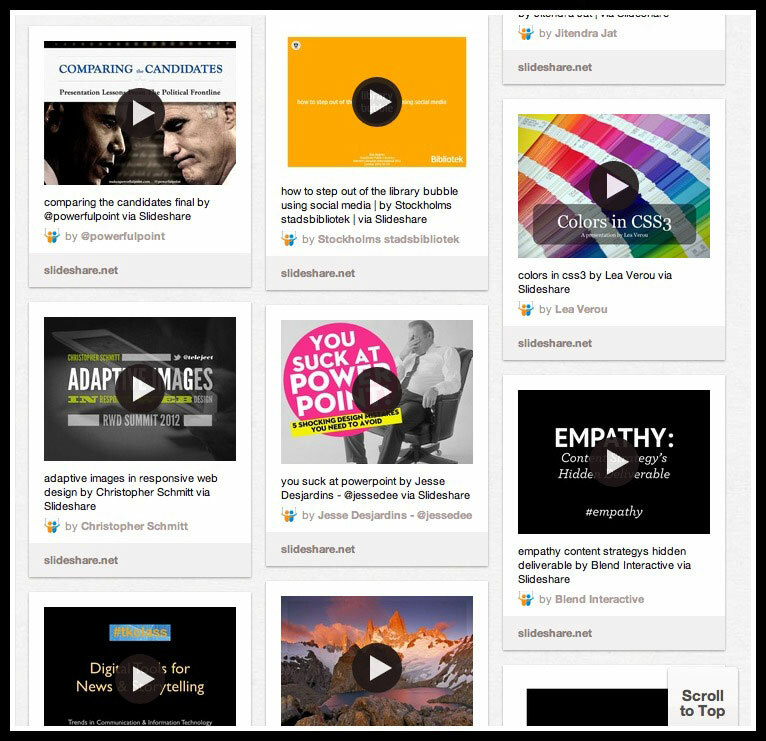 TIP: Did you know that SlideShare Presentations and YouTube Videos play from right inside the Pinterest Newsfeed? …yet they are still under utilised on Pinterest. Think about how you can be original and different. Images = Emotion and Connection. There is no doubting that we respond quickly, and emotionally to images. Use this to your advantage. Showcase your story, the “why” behind your business, with images, wherever possible. Aromatherapy and Organic Skincare Company, Twenty8.com, use images to showcase their “story”. They believe in self-care, so tips and advice is presented on a memorable image that evokes emotion. It isn’t just about their products. 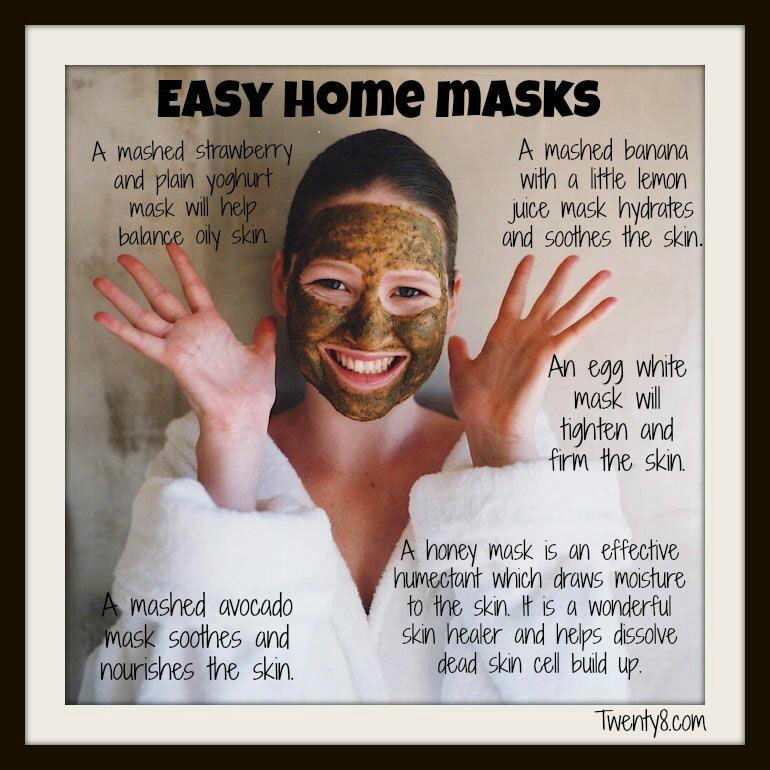 They walk the talk in terms of promoting “self care” in all aspects of life. Or in this example from the team at Twenty8.com, they include a How-To Image to Showcase their Story. Again, note that it is not about their products per se but about the culture and message behind their brand. CrowdSourcing refers to the act of outsourcing tasks, traditionally performed by a business, employee or contractor to a large group of people. The more recent “buzz” use of this word refers to the act of completing a task or finding a solution to a problem by asking your online “network” or community to help you out. Contribute to photo and video competitions, promotions or events. If you can involve your community to help you “solve a problem” such as the name of your new product, or content to share online – they will be more than happy to help you! If you can bring videos, images or photos into the mix. They will help you in a way that will share your message wider and quicker. Chantelle (aka blogger Fat Mum Slim) is a master of visuals + all things instagram photography. 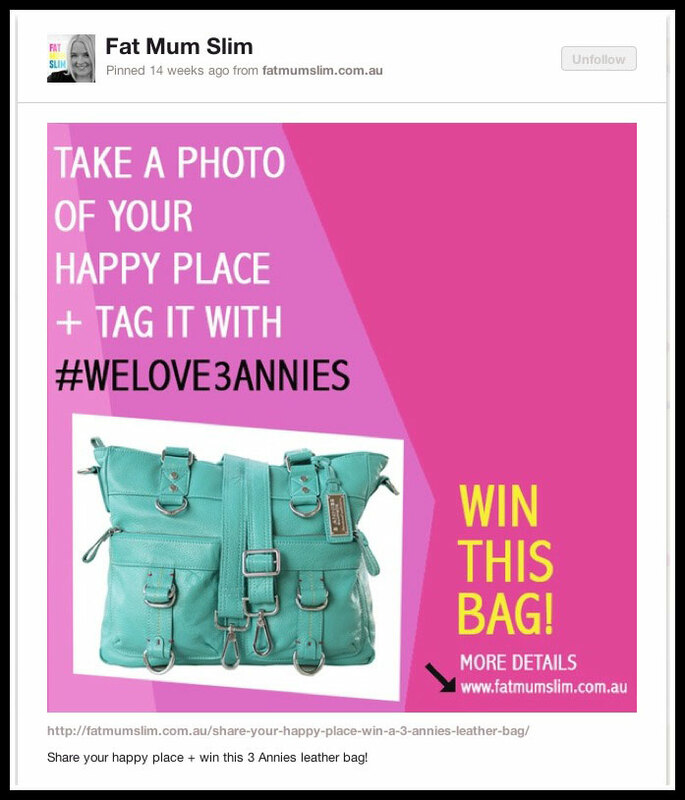 Here she uses a call to action (in fact 2 of them) to ask her community on Pinterest to join her Instagram photo competition – using a #hashtag to reference their photo entry. Adding words back is also important! Words and images together are a powerful combination. The trick is finding the right balance. Just remember that unless the image really stands alone and conveys the powerful message that you want, you may need to add back some words! “Without graphics, an idea may be lost in a sea of words. Without words, a graphic may be lost to a sea of ambiguity”. Mike Parkinson. Overlay text on Instagram photos. Tweet images (not just text!) as well as your Pinterest Pins on Twitter. Slideshare presentations on Pinterest add some Pop to the newsfeed. And they open up on the page! Add a slideshow or a Video and stand out from the crowd! 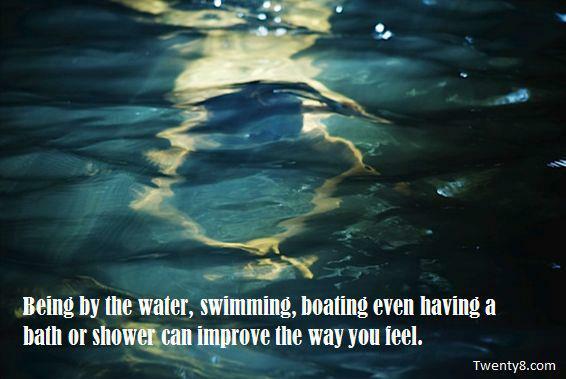 Use more images on Facebook. Change out your Timeline cover photo regularly. If there are important dates in the history of your business, add them as “milestone” images on the Facebook Timeline. 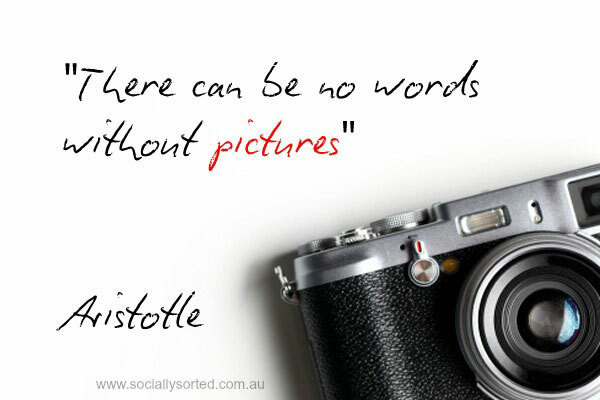 Include quality images on your Blog Posts. Refer to Tip No 2 for ideas about how to do all of the above. It’s Your Turn. 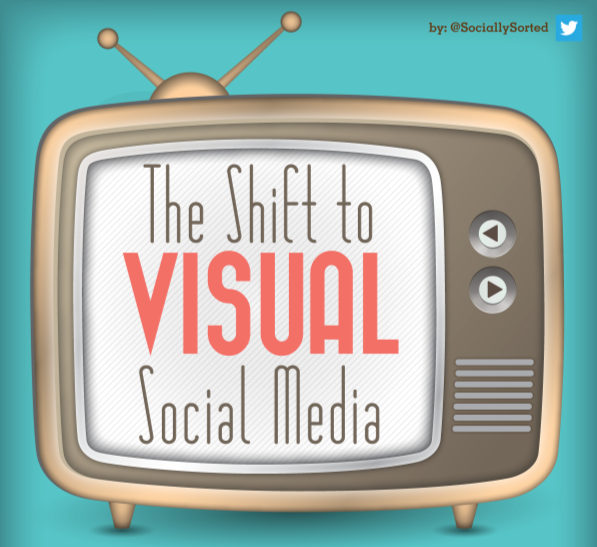 Had you noticed the shift to Visual Social Media? 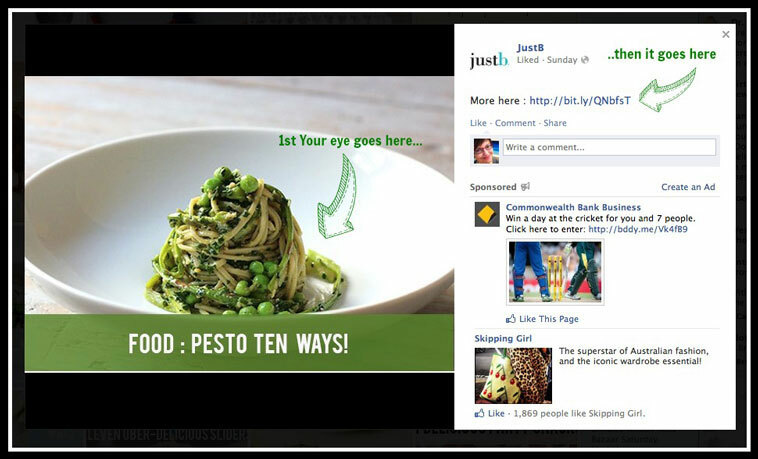 Will you be using more visuals in your social media marketing now? I would love you to comment below if something has worked in your business when using images or visual content to engage with your community. NEW WEBINAR: Learn how to Create More Traffic-Driving Visual Content. CLICK HERE to Register Now. 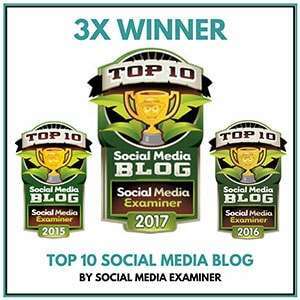 Donna is the founder of Socially Sorted, winner of Best Business Blog in Australia 2014 and a Top 10 Social Media Blog for Social Media Examiner, 2015-2017. She helps brands leverage the power of visual storytelling and content strategy in their business. Her content has been featured in publications such as Forbes and Entrepreneur Online and she is a contributor to Social Media Examiner. Donna speaks about digital and visual content for the marketing and tourism industries internationally.